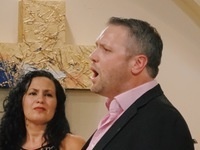 The University of Nevada, Reno Department of Music faculty members Olga Perez Flora, mezzo-soprano, and James Flora, tenor, celebrate the history of Cuban song at a recital called Canciones de mi Isla, Songs of my Island with Cuban pianist Orlay Alonso. This recital is a preview of one of two concerts Flora and Perez Flora will be performing at Humanas Linguas Multiples festival in Havana on Feb.n 26-28 in the famous Museo Nacional de Bellas Artes. This performance also features Larry Aynesmith, guitar; Davis Gervais, percussion; and Ruthie Meadows, ethnomusicologist. It is sponsored by College of Liberal Arts Dean Debra Moddelmog, the Scholarly and Creative Activities Grants Program committee, and the college’s travel grant committee. This is a free event.